Wouldn't it be neat if there were a boat with three retractable wheels that allowed it to get in and out of the water on its own? Well there is, and it's made by New Zealand-based Sealegs. Now, the company has unveiled a new electric-drive model, the Electric E4. 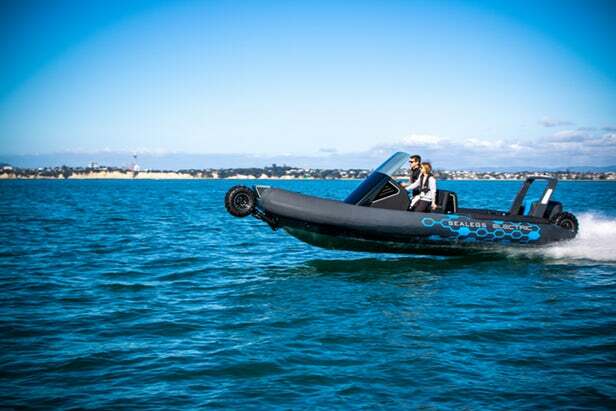 As is the case with Sealegs' other amphibious boats, the idea with the rigid-hulled inflatable E4 is that it can be driven short distances on land, going in or out of the water wherever there's a ramp or beach – no docks or trailer-launches are required. Once on the water, the wheels are retracted up and out of the way. While the Electric E4 still utilizes a 150-hp internal combustion outboard engine for aquatic propulsion, its wheels are equipped with brushless high-torque electric motors – buyers can choose between two- and three-wheel-drive setups. All of the motors are powered by a central 48-volt 7-kWh lithium battery pack, which is helped out by a regenerative braking system, an optional solar panel, and a step-up charger that draws power from the outboard motor while it's in use. Utilizing a traditional mains power source when the boat is on land, one four-to-five-hour charge is claimed to be good for up to 1.5 hours of drive time – the company says this should be about the same as 20 typical launches and returns. Measuring 7.3 meters long by 2.7 meters wide (23' 11" by 8' 10"), the E4 weighs in at 1,390 kg (3,058 lb) and can handle a maximum payload of 700 kg (1,543 lb). A top speed of 10 km/h (6 mph) is possible on land, with the craft reaching up to 74 km/h (46 mph/40 knots) on the water. Other features include a 24-inch touchscreen information/control panel, push-button wheel deployment/retraction, seating for up to eight people, and a sun lounger located in the bow.